Vintage American Guitars | Rare Dall' Aglio Cello | Skinner Auction | Skinner Inc.
BOSTON, Mass. 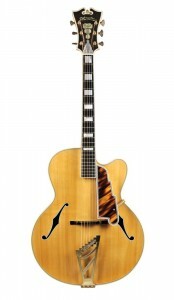 – APRIL 17, 2013 – Skinner, Inc. will host an auction of Fine Musical Instruments on Sunday, April 28th in its Boston gallery. The sale offers more than 300 lots of stringed instruments including vintage American guitars, violins, cellos, and bows, as well as two instruments by Giuseppe Dall’ Aglio of Mantua. Instrumentalists are welcome to come play the instruments during the previews on April 26th through April 28th. The spring auction features a fine collection of vintage American guitars ranging from parlor styles and archtops to solid body electrics and jazz guitars. A standout among these is a 1962 D’Angelico Excel (lot 23, estimated between $30,000 and $40,000) from the collection of Don DeMarco. Throughout a career of countless recording sessions and concert dates as accompanist and music director, Mr. DeMarco kept this guitar for his private use as the prize jewel of his collection. It has received meticulous care and remains in extremely fine condition. Electric guitars include a 1957 Les Paul with its original case and rare black pickguard and black pickup surrounds (lot 15, $60,000 to $80,000), a 1958 Gibson ES-335 (lot 14, $25,000 to $30,000), a 1953 Fender Telecaster (lot 18, $22,000 to $28,000), and a 1965 Fender Stratocaster (lot 28, $15,000 to $30,000). Notable Martin guitars include a 1925 C.F. Martin 00-28 (lot 12, $12,000 to $18,000) and a 1969 C.F. Martin D-21 (lot 13, $3,800 to $4,800). A rare violoncello by Giuseppe Dall’ Aglio of Mantua circa 1826 (lot 38, $30,000 to $50,000) is the first example to be offered at auction. Renowned expert Dario D’Attili noted that the instruments of Dall’ Aglio have the narrowest point of the body high in the upper curves of the C-bout, and that the lower corners are abruptly turned outwards. This second characteristic is quite evident in the violoncello. The top and back arches are quite flat and full, and it is covered with a rich, pasty, red-brown varnish. Dall’ Aglio cellos are quite rare and sought-after, and are generally regarded as being of excellent quality. A fine English violoncello from 1782 by John Betts (lot 41, $60,000 to $80,000) is accompanied by a W.E. Hill & Sons certificate from 1936 and a William Moennig & Sons certificate from 1960. As apprentice to the renowned maker Richard Duke, John Betts developed into one of England’s most respected dealers and experts, and was responsible for making London a major center of the violin trade. He also employed many of the best makers of the day in his shop, including Vincenzo Panormo. 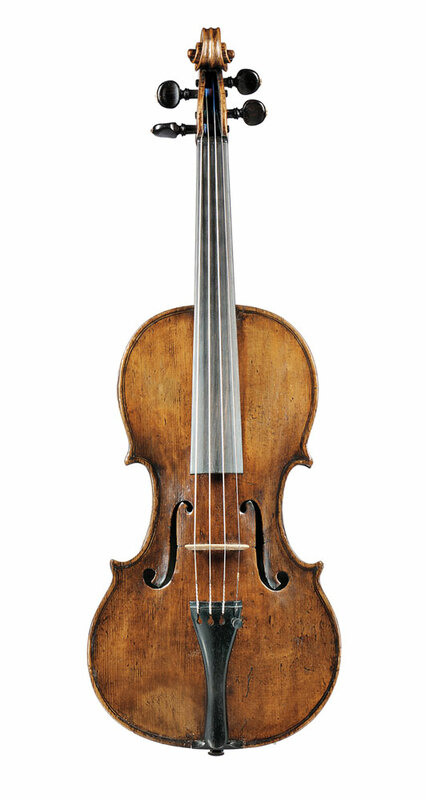 A modern Italian violoncello from 1912 by Rodolfo Fredi (lot 33, $15,000 to $25,000) will also be sold. Among the fine violins offered is a second Giuseppe Dall’ Aglio: a violin accompanied by a W.E. Hill & Sons certificate from 1946 (lot 42, $30,000 to $50,000). The excellent violinist and teacher Steven Staryk selected this violin for one of his pupils in the late 1960s. Its design, like the violins of Lorenzo Storioni of Cremona, borrows heavily from late examples of Guarneri del Gesu, exhibiting features distinctive of del Gesu’s pattern: long, shallow C-bouts, and long, narrow ffs. Interestingly, the asymmetry of the upper bouts mirrors another Dall’ Aglio of the exact same size that was sold at auction in 2002. However, the pattern is reversed, perhaps because the maker’s inner mould was flipped over! An Italian violin by Giuseppe Baldantoni circa 1830 accompanied by a Peter Biddulph certificate from 1991 (lot 45, $30,000 to $50,000) and a French violin by Hippolyte Chrétien Silvestre circa 1900 (lot 37, $9,000 to $12,000) will also be sold. French bows include a silver-mounted violoncello bow by Jules Fetique accompanied by a Paul Childs certificate from 2012 (lot 65, $6,000 to $8,000) and a silver-mounted violin bow by Emile-August Ouchard (lot 226, $5,000 to $8,000). Five bows from the collection of inventor and bowmaker Arnold R. Bone will be offered, including a French silver-mounted violoncello bow, probably Louis Gillet for George Dupuy (lot 52, $3,000 to $5,000), and a silver-mounted violin bow by H.R. Pfretzschner (lot 51, $2,400 to $3,000). Previews for the auction will be held on Friday, April 26, 2013, 12 p.m.-7 p.m., and Saturday, April 27, 2013, 10:30 a.m.-5 p.m., and Sunday, April 28, 2013, 9 a.m.-10 a.m. On Friday, April 26th at 5:30 p.m. Skinner will present live jazz from the Kana Dehara Quartet, and on Saturday, April 27th, The Boston Conservatory Honors String Quartet will perform on instruments to be sold in the following day’s auction. Register for these events online. An illustrated catalog for sale #2648B is available by mail from the subscription department at 508-970-3240. It is also available at the gallery. This entry was posted in News and tagged auction, boston, cello, Dall' Aglio, David Bonsey, fender, french bow, gibson, guitar, Italian violin, martin, music, Musical Instruments, rare guitar, skinner, stringed instruments, vintage guitar, viola, violin, violin bow by Skinner. Bookmark the permalink.